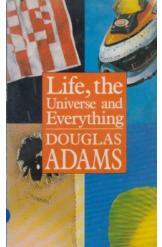 Life, the Universe and Everything by Douglas Adams, Sci Fi. Book is in good condition, all pages intact. In the wake of the previous book's events, Arthur Dent has been living in a cave on the new prehistoric Earth. Somehow, things get even worse. Book 3 of the Hitchhiker's Guide to the Galaxy series.